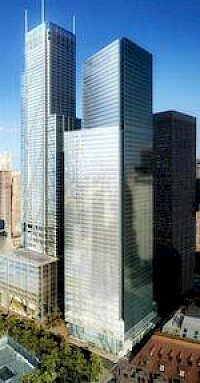 150 Greenwich Street is the address for a new skyscraper being erected as part of the World Trade Center reconstruction in New York City. 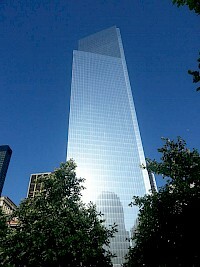 The office building has also been referred to as Four World Trade Center and will be on the east side of Greenwich Street, across the street from the original location of the twin towers that were destroyed during the September 11, 2001 attacks. Carnegie 57 is a 75-story skyscraper currently under-construction in New York City. 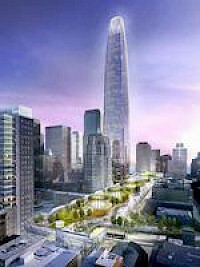 Upon completion in 2013 it will stand at 306 meters (1005 feet) tall, making it one of the tallest buildings in the city. The mixed use tower is developed by the Extell Development Company. 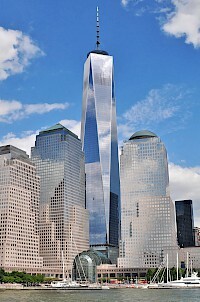 Foundation work started in January 2010, and it´s currently the second tallest tower in New York under-construction, surpassed only by One World Trade Center (541 meters, 1776 feet). 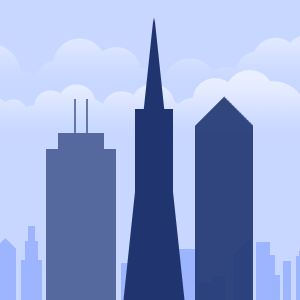 The San Francisco Transbay development plan consists of three supertall skyscrapers and ten other skyscrapers and highrises proposed in San Francisco. The towers are proposed to fund the replacement of the San Francisco Transbay Terminal in the South of Market neighborhood near the Financial District. The supertalls comprise only three of the 13 towers of the Transbay Project. Five of the 13 towers are part of Renzo Piano's complex and the other eight are Transbay Towers.